Here's the fantasy rundown heading into Week 10. 1. 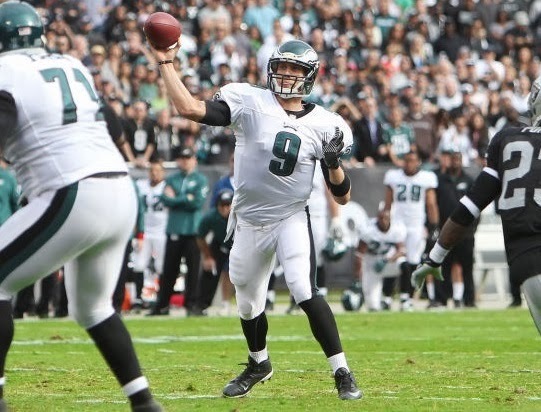 What's next for Nick Foles? In one of the greatest regular season performances by a quarterback in NFL history, Nick Foles shredded the Raiders last Sunday to the tune of 406 yards and 7 touchdowns, setting or tying multiple league records in the process. For people who are now on the bandwagon, in his previous game, Foles was 11-29 for 80 yards against a 31st-ranked pass defense (Cowboys). Despite the fact that Chip Kelly hasn't named Foles as the permanent starter, one major stat in his favor is that he has yet to throw an interception in 118 pass attempts this season. Good sign moving forward. 2. Can Stevan Ridley be trusted again? Even though he was benched earlier this year, the short-term answer is yes. Ridley has averaged over 5 yards per carry and has scored 6 TDs over the last month. Obviously Ridley owners have to be wary, because the next fumble or dropped pass he has could land him back on the bench, but at this point, he's worth the risk. Why? Because the 24-year-old is getting the majority of the carries inside the 10 yard line. If this trend continues, he should eclipse his touchdown total from 2012 (12). 3. Antonio Brown has been one of the few bright spots in Pittsburgh this season. Things have not gone well in the Steel City this year, with the Steelers currently sitting at 2-6, dead last in the AFC North. However, one positive has been the play of Antonio Brown, who is on pace for over 120 receptions this season, which would crush the franchise record. Brown leads the NFL with 61 catches, and is also top 10 in targets with 86. For sheer volume, Brown has been one of the best bets at his position, and even though he has only scored 3 TDs this year, he's still worthy of WR1 status in both standard or PPR formats. 4. Zac Stacy is the truth. The Rams have done little on the offensive side of the ball this season, but when Stacy has been a focal point, he's made things happen. Over the last five games, Stacy is second in the league in rushing yards, and he has gone over the 125-yard mark two-straight weeks. The rookie out of Vanderbilt is the perfect physical, bowling ball-type runner that coach Jeff Fisher loves, and has not had since his Eddie George days in Tennessee. As long as Kellen Clemens continues to struggle in the passing game, it will mean a ton of touches for Stacy over the second half of the season. 5. Who can replace Aaron Rodgers? Rodgers went down with a collarbone injury Monday night that could keep him out of the lineup for several weeks. This has owners scrambling for a backup plan. First things first; Seneca Wallace is not an option. Green Bay's passing game will be greatly reduced with Rodgers on the sidelines, so if you don't have a solid No. 2 QB on your roster, you could roll the dice on someone like Joe Flacco or Terrelle Pryor. Both are capable of doing an admirable job of filling in for a few games. If you're in a deeper league, Case Keenum could be your answer, throwing for 621 yards and 4 scores in his first two starts. Just don't do anything drastic. Rodgers won't be out that long.